The first issue of BJHS for 2019 brings with it some good news: the joint winner of our 2014 Singer Prize for an article by an early career researcher, Jenny Bulstrode, has gone on to win the 2018 Sarton Prize for History of Science. Awarded by the American Academy of Arts and Sciences, this prize recognises her achievement and promise as an emerging scholar in the field. The British Society for the History of Science sends its warm congratulations to Jenny and is proud to have played its part in the advancement and recognition of her scholarship. Next, Jim Bennett takes us to sea with ‘Mathematicians on board’, exploring how Nevil Maskelyne and Robert Waddington came to engage with the navigational practices that were part of shipboard routine, and how their experiences affected the development of the methods that they separately promoted on their return. The theme of the training and cultivation of the scientific persona continues with David Stack and his paper ‘Charles Darwin and the scientific mind’. The scientific mind has been a much touted entity over recent decades, and here Stack examines its contingent historical construction, finding new ways to read Darwin’s autobiography along the way. 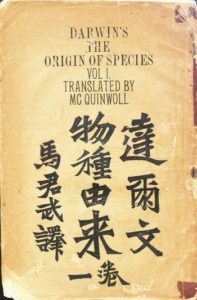 Image: The first edition of Daerwen wuzhong youlai, yijuan (Darwin’s Origin of Species, vol. 1), was circulated on 1 December 1903 by Wenming Book Company and Guangyi Book Company in Shanghai. The volume (pictured here) was reprinted in 1906. © 2018 Trustees of Australian National University Library.